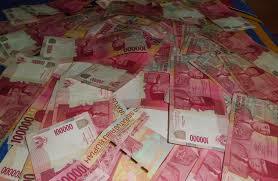 Pesugihan story through the action of procuring money by Kanjeng Dimas last weeks of increasingly pursed alone. Since the three reported by the complainant to the East Java police for allegedly breaking the law by skimming scams Rp. 3.1 billion, hence the name Kanjeng Dimas suddenly became popular in the world of national news. Actually this case is a civil case always, be of interest to the public because there are frills doubling the money. Later, a former member of Parliament during the third period of Marwah Daud is currently the Head of the hermitage foundation bandwagon spoke up, defending and justifying Dimas Kanjeng ability to multiply money. Dimas Kanjeng figure whose full name Personal Obey the usual male figure as general. Born in 1970 in the village of Wangkal, District Ivory Probolinggo, East Java. He established a hermitage Kanjeng Dimas since 2002 and set up a practice pesugihan double money since 2007. And in fact today's events have occurred since 2007 and reached its peak in July 2013 ago. If explored carefully, not only Kanjeng Dimas who opened the practice of doubling the money, but there are a lot of the same practice, often on offer in the world of online media. Really Kanjeng Dimas was able to double the money? In recognition of the time in East Java Police investigators check as in the media release tempo, Kanjeng Dimas claimed to have Ifrit to double the money. But when asked investigators to show his skill, it is ridiculous Kanjeng argued Dimas, his genie was gone because of contact with police tear gas during an arrest him. If analyzed by logic and common sense, it is possible there are people who were born and have a miracle to double the money. Miracles are known only possessed by human beings who nicknamed and stamped prophet. Beyond that I think, is utter nonsense. Perhaps there is truth, doubling the money was made through an intermediary jin. Along my guess is that, apart in jawapos.com sites Mahfud MD, former Chairman of the Constitutional Court also commented that there is the possibility of money crates on display Kanjeng Dimas derived from jin. Of the five types of jinn, then the genie Ifritlah often used paranormal. Because genie is able to work with a man. Matter how it works jin double money, this part is hard to chew common sense and not be denied for a sane man considered a hoax. Even if oriented videos are widely scattered Kanjeng Dimas on youtube then none show how jin Ifrit is working to double the money. Doubling the money is a way of thinking lazy, greedy ambitions wants to get rich quick. This opportunity also greeted positively fraudsters paranormal big fish labeled as a business opportunity that can bring additional income for them. Whether true or not, the fact crates of money in sight. Search results on some of the leading sites nationwide revealed, for double the money it takes intermediaries jin Ifrit. Without it, humans are still ordinary people who are born with the ability to mediocre.